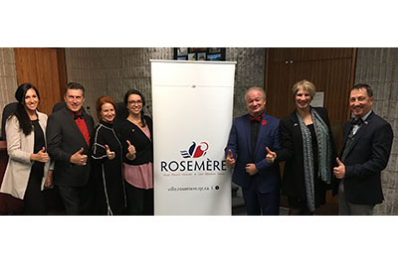 ROSEMÈRE, November13,2018 – This past November10 marked the first anniversary of the swearing-in of Rosemère’s current Town Council. After 365days in power, the Westram administration can assert that it has succeeded in putting the solid foundations in place for a proud, green and prosperous town. Drawing on visionary leadership rooted in the principles of outreach, responsiveness, dialogue and respect, the Town Council has put various actions and initiatives in place to honour its commitments. “The participation and engagement of residents and Town employees are at the core of our values and convictions. That is why we have developed a number of initiatives to encourage people to get involved and foster greater transparency,” said Rosemère Mayor Eric Westram. These efforts have included introducing an open discussion period before Town Council meetings and webcasting the proceedings, holding public consultations and surveys on various matters, such as the future of Rosemère and cannabis by-laws, hosting monthly Mayor’s Breakfasts and more. Like the majority of Rosemerites, the Westram administration is very concerned about issues that affect the environment. In January, it launched an award-winning pilot project to use wood chips as a road salt alternative. In its 2018budget, the Westram team modified drinking water rates to preserve this precious resource. In addition to being certified as a monarch-friendly community by the David Suzuki Foundation, Rosemère spearheaded an urban beekeeping project at Hamilton House during the summer in an effort to help local bee populations thrive. A number of cultural projects have also emerged during the year, including the creation of two new sculptures at Place des jeunes and the Town library. Moreover, in keeping with the high priority placed by the Council on resident safety, a new intermunicipal agreement was reached in September to ensure access to firefighter-provided first responder service. “In 2018, we have delivered on more than half of our stated commitments. We are very proud of these results and are working closely with residents and Town employees to bring our other commitments to life as well,” Mayor Westram added. Although the first year of the Westram administration’s term has been productive, the next three aim to build even further on this momentum with a series of forward-looking projects. In the coming year, the Town will finalize a strategic planning exercise regarding Rosemère’s future, while continuing to implement its three anchor projects– realizing Rosemère’s urban vision, getting the infrastructure and facilities needed to achieve Rosemère’s goals effectively and affordably, and modernizing the administrative apparatus– to make Rosemère a proud, green and prosperous town. “Sixty years into our history, we are at a crossroads in Rosemère. We want to work with the public to pave the way to a future that will give us the confidence to embrace an age of renewal and consolidate our strengths. We call on all Rosemerites to help define this future with us,” concluded MayorWestram.